Say GOODBYE To Traditional Tool! Do you want to COMPLETE your work 10x times faster than using a traditional trowel or DELIVER impressive results compared to using normal trowels? Well, you need this Spray Paint™ Cement Spray Gun! The new generation of spray paint of the professional spraying for cement, water mud, lime slurry, waterproof mortar and other thin materials spraying construction with efficiency. Spray Paint™ Cement Spray Gun EASY TO OPERATE and the general air compressor can be produced. Whether it is home decoration, or large construction site painting instead of traditional technology, improve work efficiency. Comes with a handle that is a convenience to you and improves work efficiency. Simply connect the sprayer into the air compressor machine and enjoy your wall being smoothly and nicely sprayed with stucco. 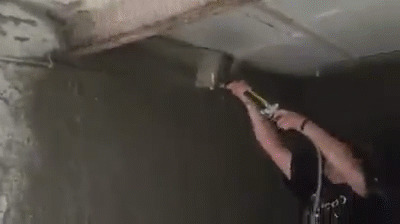 You can also enjoy the blasting power of the sprayer with mortar and plaster too. We suggest to maximize the blasting power capacity of our sprayer, the compressor or air pump attached to the sprayer should be 7cfm @ 90 psi or larger.